Domain registration is the process by which a company or individual can secure a website domain, such as www.yoursite.com. Once you have completed domain registration the domain becomes yours for the period of the contract, usually one year. Before registration expires it must be renewed, or the domain reverts back to being available to the general public. The Internet Corporation for Assigned Names and Numbers (ICANN) manages the international Domain Name Server (DNS) database. ICANN insures that all registered names are unique and map properly to a unique Internet Protocol (IP) address. The IP address is the numerical address of the website that tells other computers on the Internet where to find the server host and domain. Domain registration is available to the public via a registrar. Fees and services vary from company to company, but the process is generally inexpensive. Before a domain registration can be approved, the new name must be checked against existing names in the DNS database. The online registrar provides a field into which you can enter your desired name and hierarchy - that is, the letters that come after the "dot." Familiar hierarchies are .com, .net, .org, .name, .info and .biz. 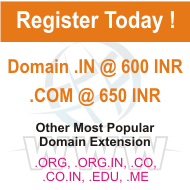 If the name is not already taken, it is available for domain registration.